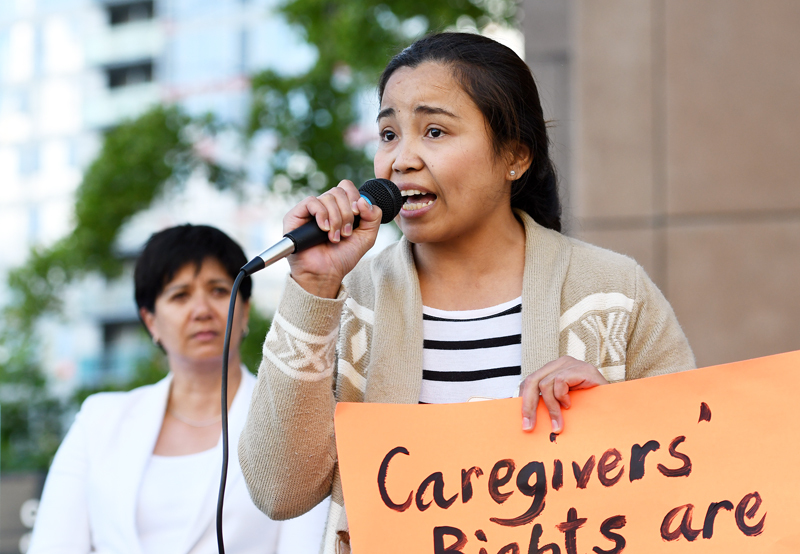 Former caregiver Hessed Torres speaks at a rally to mark International Domestic Workers Day on June 16, 2016. Canada’s efforts to prevent abuse of Live-In Caregiver Program are backfiring, say critics. International Domestic Workers Day, marked worldwide on Thursday, was supposed to be an occasion to celebrate the United Nations’ landmark adoption five years ago of labour standards for one of the most vulnerable workforces. But according to live-in caregivers and their supporters in the Vancouver area, there’s little to celebrate in Canada. On Thursday evening, more than 60 domestic workers and their supporters rallied outside the offices of the Canada Border Services Agency. Speakers from several organizations behind the rally, including Drolet’s association and Migrante B.C., criticized CBSA’s Project Guardian — a little-publicized initiative launched in early 2014 in the wake of reports the Live-In Caregiver Program was being abused by some employers. The agency was not immediately available for comment on Thursday, but CBSA previously told Metro it investigates tips and referrals to prevent “misuse” of the Live-In Caregiver Program, and that there’s already a process by which domestic workers can switch employers once in the country — enforcement, the agency said, is taken only against those deemed “inadmissible.” Project Guardian is a “continuous part of our business,” CBSA stated, of enforcing the Immigration and Refugee Protection Act. “The policy is misguided and heavy-handed,” Drolet countered. “In the 30 years of our organization, we’ve never before had workers come to our offices after having been arrested by CBSA. She said being removed from Canada and losing the chance of becoming a permanent resident here after contributing to the economy is “devastating” for domestic workers.